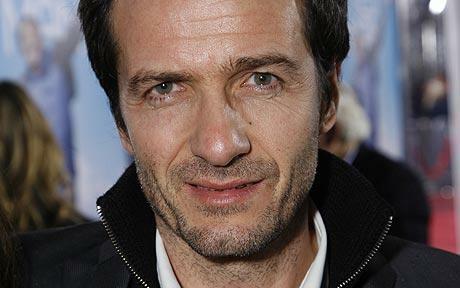 In a new interview discussing Harry Potter and the Deathly Hallows: Part 2, producer David Heyman commented on the cinematic translation of some of Deathly Hallows’ juiciest moments. Be aware that the following quotes contain numerous spoilers regarding Snape’s role, the battle of Hogwarts, the epilogue and more, so read on as you desire. In the footage we saw today, there’s a scene of Snape and McGonagall facing off in the Great Hall, which I don’t remember happening at all in the book. They do face off, but it’s not in the Great Hall. There are a lot of things there that are slightly different from the book, but they are true to the spirit to the book. Snape and McGonagall do face off in the book, but it’s in a corridor as Harry’s on his way to the Ravenclaw common room. So the Pensieve moment stays in too? Yes, that and Dumbledore [at King’s Cross]. Is the mewling creature on the floor at King’s Cross still in there? How did the actors go into the scene, growing into themselves 15 years later? They look good. It’s subtle. It’s going to be very interesting to see the response, since inevitably we know it’s Dan, Rupert and Emma, and we’ve just seen them as 17-year-olds. Initially we went a little further [with the effects], and then we pulled it back. Sometimes if you try too hard you’re really aware of the work. You won’t have huge wrinkles, obviously there’s a difference, but you still resemble yourself. 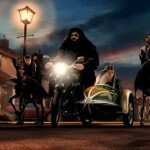 Want to go to the ‘Deathly Hallows: Part 2’ premiere in London or New York? We’ve been receiving a lot of questions lately asking us how the London and New York premieres of Harry Potter and the Deathly Hallows: Part 2 will work, and to clarify exactly how fans can attend. Given that this will be the final ‘Potter’ premiere, we thought we’d publish a guide detailing everything you need to know about the upcoming premiere events. Where will they be held? The world premiere in London will be held on 7 July in both Trafalgar Square and Leicester Square. The red carpet event will take place in Trafalgar Square, before cast, crew and guests make their way to Leicester Square to see the film. The US premiere will be held in New York City on 11 July at Avery Fisher Hall. Is it free to turn up and watch the stars? Yes! It’s completely free to turn up and watch the stars arrive. You’ll need to get there fairly early to get close to the barriers (we’ve heard stories of super keen fans camping out days in advance) to have a chance of obtaining autographs and photos. Check out some of our photos from the Los Angeles premiere of Order of the Phoenix in 2007 and the London premiere of Deathly Hallows: Part 1 in 2010 to get an idea of how things will look on the day. How can I walk the red carpet and attend the premiere screening? Warner Bros. invite cast and crew, special guests and members of the press to see the premiere screening. Don’t fret however, there are always competitions run in the months leading up to the premiere event allowing fans the chance to win tickets. Play.com is giving fans the chance to win two tickets to the world premiere in London. 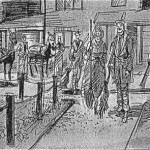 Enter by clicking here. PopSugar is giving fans the chance to win two tickets to the New York City premiere. Enter by clicking here. We’ll be updating this post as we hear more information about the New York premiere and receive any info about competitions, so bookmark this page and check back regularly! Also, we’ll be sure to let you know of any updates to the page via Twitter (we’re @hpfz), so be sure to follow us for the latest info and competition news. Are you planning to attend one of the premieres? Let us know! Warner Bros. has sent over an exclusive behind the scenes video showing the making of the seven Potters sequence from Harry Potter and the Deathly Hallows: Part 1. The clip comes from the Deathly Hallows: Part 1 Blu-ray, released on 15 April. 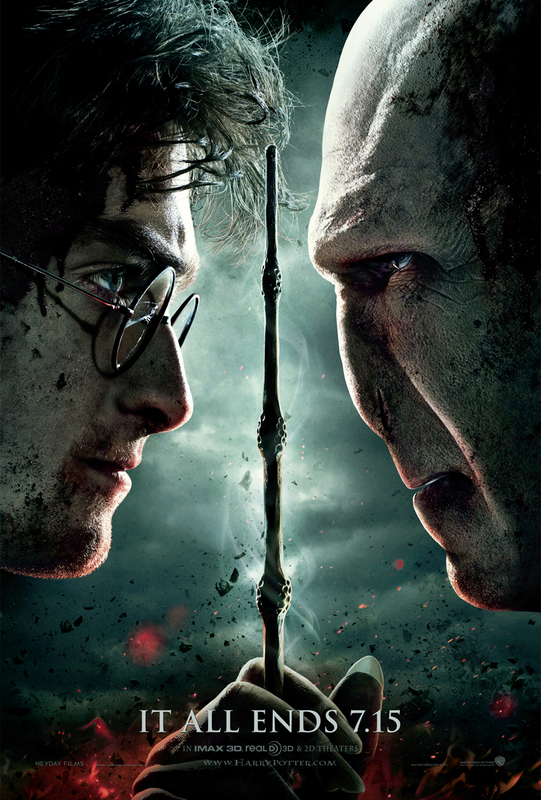 Check out the first poster for Harry Potter and the Deathly Hallows: Part 2 featuring a battered and bruised Harry and Voldemort. 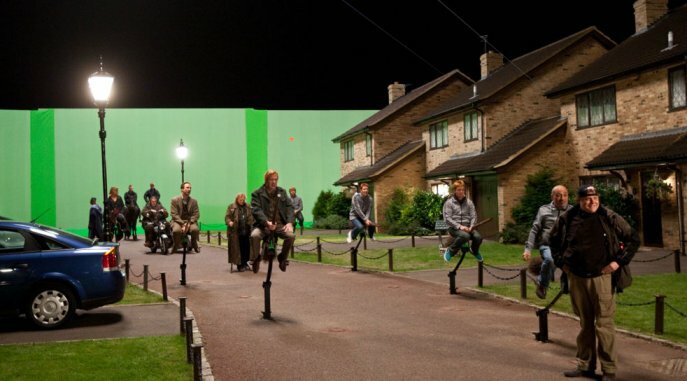 Check out a number of behind the scenes photos and concept artwork of the seven Potters sequence in Harry Potter and the Deathly Hallows: Part 1 below. 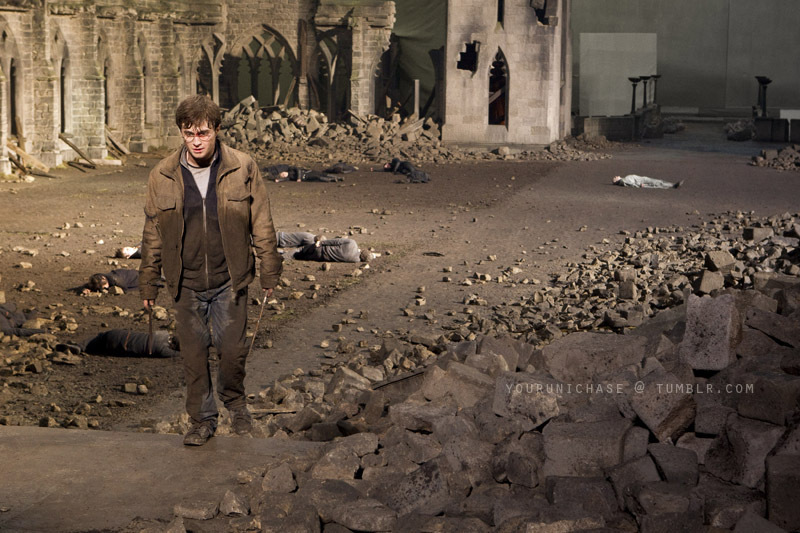 A promotional photo from Harry Potter and the Deathly Hallows: Part 2 has surfaced today showing Harry walking away from a defeated Voldemort with two wands in hand.